Today’s Nice Price or Crack Pipe E30 isn’t just an amazingly desirable ride owing to its E46 M3 drivetrain, it’s also a learning opportunity since its manual windows will let you demonstrate to kids what it means to “wind them up.” Could that two-fer be worth its new car price? Asking $15,000 for yesterday’s 2001 Toyota 4Runner with its diesel conversion did not go over well. In fact, it did not go over at all. Instead that dinged-up sport ute went down, way down, in a 93 percent Crack Pipe loss. That was one of our worst losses this year, and perhaps as way to cleanse the mental palate today we’re serving up something extra special tasty. That’s a 1990 BMW 318i Touring with what looks to be a clean S54/6-speed conversion. Hopefully its price won’t leave a bad taste in your mouth. First off, the car. 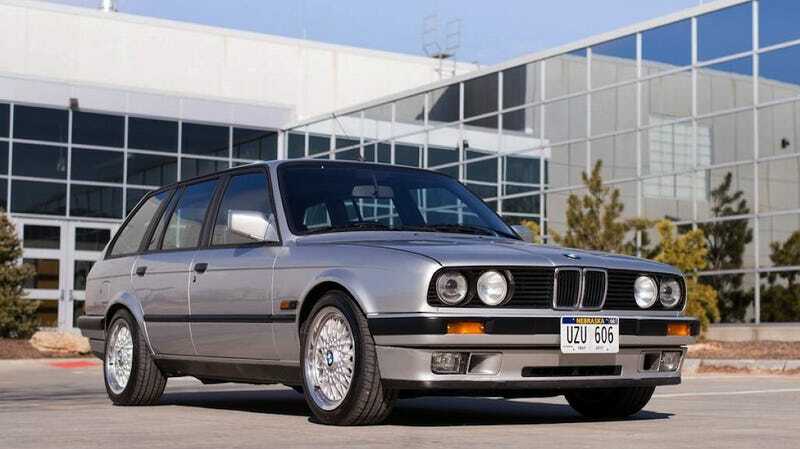 We never got the E30 Touring here in the States, which is a pity since its both handsome and versatile. I know that many of you question the reverence paid to the E30 overall, but like the precedent Neue Klasse cars, these are gaining in both lore and value. The wagon edition is especially covetable owing to its exclusivity. Fortunately, the model’s age means that today they can be brought into the country without much of a hassle. This one is here, and it’s a relative Wolf im Schafspelz. The car presents well, with a seemingly flaw-free Sterling Silver Metallic outer coat and a grey and black cloth interior. That all rides on appropriate BBS RZ alloys that bolt to five-lug converted hubs. Behind all that lies a rebuilt suspension with Touring-specific H&R springs and Koni adjustable shocks. Brakes are E46 discs with braided lines and are assisted by way of a Porsche 924 booster. The ad claims the car was originally sold in Italy and was imported from the boot to the U.S. prior to its updates. No mileage is available for the car, but the S54 six and its Getrag accomplice both have 65K on them. Those came from a 2005 M3 convertible that had been rear-ended. The conversion was undertaken by a “local enthusiast” and, according to the ad, was executed without compromise. The A/C and heat are both said to work, and the dash is free of warning lights or pegged gauges. That dash is appreciably intact. The E30 is known for dashes that crack, a visual blight that can really ruin the experience seeing as you have to look at it all the time you’re behind the wheel. This one looks fabulous as does the rest of the space. Being an Italian market 318i at heart, it is lightly kitted and hence if having to wind your own windows would prove a deal killer then this is not the car for you. Likely, all the other tactile elements in here, from the M sport steering wheel to the Alpina upholstered sport seats will more than make up for your arms getting a workout. A new headliner tops the space all off. The under-hood appearance is equally tidy and doesn’t look like a conversion at all. The 3246cc DOHC six fits snuggly but without major modification of the space. That 333 horsepower mill sports an iron block and two extra pots over the original mill so the revamped springs and shocks will be much appreciated beneath. The exhaust should still meet emissions too as the builder was conscientious enough to fit the car with cats. Those are high-flow units and they spit their stuff through a glasspack and Borla center silencer and then on out a Magnaflow rear muffler. The build is clean and the title is clear. Yes, this is a pretty expected build, but it’s seemingly been handled with care and conscience. All that begs the question, why is it now for sale? It’s being offered by what appears to be a consignment seller so the rationale is not given. The price is however, and that’s a cool $35,000. What’s your take on this S54-rocking E30 and that new-car price? Does $35K seem fair for what’s gone into this Bimmer? Or, does that price this Touring less than alluring? Sioux Falls, ND Craigslist, or go here if the ad disappears. H/T to Greg Lembree and Todd Santoro for the hookup! Devil in a Blue Dress Selling BMW E30 Touring for $15,000!